Humans have been running since the beginning of time—long before the invention of the modern running shoe. Which begs the question: Were early runners plagued with injury? Modern researchers say no. It turns out that the bare foot may be pretty well suited for running on its own, without the aid of footwear. Recent research indicates that humans were able to run comfortably and safely when barefoot or in minimal footwear by landing with a flat foot (mid-foot strike), or by landing on the ball of the foot before bringing down the heel (forefoot strike). 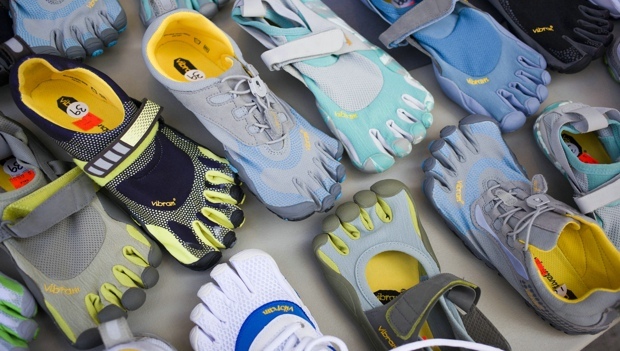 More: Is Barefoot the Perfect Running Shoe? These kinds of foot strikes have some biomechanical differences that offer real benefits. Because of these elements, many runners have recently adopted barefoot running or have turned to minimal footwear and are reaping the rewards. Harvard University defines minimal footwear as, "any footwear that lacks high-cushioned heels, stiff soles and arch support." There are several options of minimal shoes available. To mimic the barefoot running styles of our ancestors, many minimalist runners adopt "barefoot" shoes, or foot gloves. These shoes offer no heel cushion and minimal protection from hazards. Those who want slightly more support, cushion or additional traction, may want to choose a racing flat. RRCA and USATF-certified running coach Sean Coster is an advocate of the minimalist or barefoot running trend. "In general, it's probably a positive trend in the long run for consistent runners to be getting into less of a shoe, or at least a shoe with less of a bulky heel," says Coster. "This is why kids who grow up in third-world countries are often successful runners. By running barefoot, they develop a low arch and a stable foot. This is always going to be an advantage." Because traditional running shoes tend to encourage runners to strike the ground with the heel first, this puts a lot of pressure on the body. "The farther the heel is from the ground, the more acceleration forces you're going to have when that heel hits because it's almost always going to hit on the outside and move inside. "You create a lever-arm with the bigger wedge on that shoe. Getting a lower heel to forefoot can help with dorsiflexion and plantar flexion," says Coster. This allows the foot to move and flex appropriately. As a runner begins to adapt to wearing a foot glove or a racing flat, he/she will begin to see flexibility and elasticity in the Achilles and soles of the feet. "That supplements the planes of fascia, which improves muscle function," says Coster. "That's kind of nonexistent with a traditional running shoe."